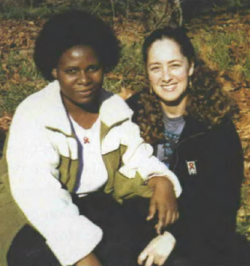 Sue Hedden is an English-speaking South African who has lived in KwaZulu-Natal most of her life. The former high-school teacher of Zulu was living at the Buddhist Retreat Centre, in lxopo, KwaZulu-Natal, South Africa, when two employees died from the AIDS virus. She and the Centre’s spiritual teachers, Kittisaro and Thanissara, found that young people in the neighboring Chibini community were “dying like flies.” Funerals seven days a week meant there was no time and money for social gatherings. Sue – through the new Woza Moya Project – is now starting to help people to cope with the AIDS situation.